If history tells us anything, its that it repeats itself. Star Wars has always been an enormous success from the films, games, books, comics, and even television. The Clone Wars set new heights for fans and caught everyone off guard. Even in the entertainment industry it kept setting new bars in animation, story telling and sound proving that it deserves its place in history and it did a damn good job at proving it to us. Star Wars Rebels is nothing short, and it should never be treated as such. The hype you hear is the hype it well deserves. The beginning of this story for Ezra is nothing to shy away from even if on the surface it might have a few laughs of innocence. It is written and placed with serious meaning in the over all story of the Star Wars universe just like The Clone Wars story arcs that held such weight and bearing and left a lot of impressions on everyone. When we meet Ezra all he has known his entire life was that of the imperialistic Empire and the worn out Capital City that has seen better days before the Empire took it over in the outer rim. Its citizens are tired and welcome any type of relief they can get. Ezra lives the life of a thief and tries to always mess with the imperial officers and troopers. He’s never left the planet but has only heard stories of events that have taken place beyond its atmosphere. The way the show grabs us out of our seats and throws us back into a galaxy far, far away in a place we feel familiar to but is entirely new, is exciting and welcomed. Not just because we have missed our weekly stories but because we get to learn and feel for these new and exciting characters, their relationships between each other, and where they fit into this grand scheme. We get to take on their epic stories that will open the doors to the mysterious time between the two trilogies that ultimately brought us to this galaxy initially. I can’t think of a better show to strap us in and thrust us to a new era. 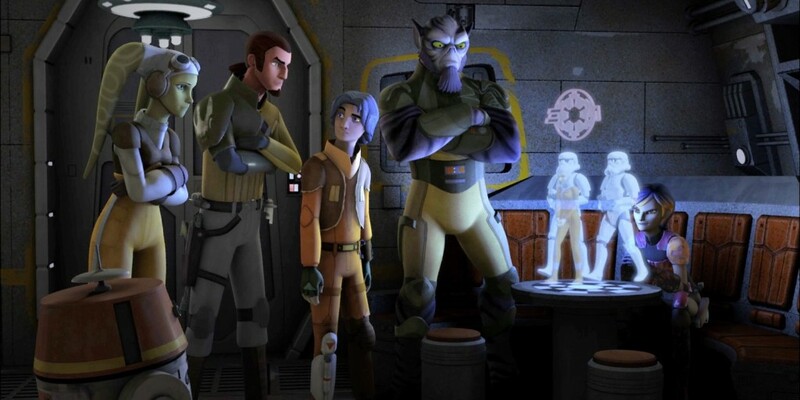 The relationship that immediately starts to form between Ezra and Kanan makes you want Kanan to take Ezra under his wing and show him the way of the Force, but you come to realize he’s stubborn and even Kanan is a little inexperienced in they ways of being a role model, teacher and master. But the family that inhabits The Ghost is a strong one that you feel you have known forever. It doesn’t take long for you to like them and you quickly get enveloped in the story. The laughs and references in the show are great and well written. Some gags you might not initially find or realize but others stand out plain as day. If you can find these it makes it even more exciting to watch and have these little tid bits added in to the roller-coasters you ride in each episode. They’re done a lot better than they were in The Cone Wars when it was painfully obvious. Star Wars Rebels gets it, and does the fans justice. The adversaries in the series are brilliant and mean what they say. They fight and keep fighting and then keep fighting some more. Using brilliant tactics to try to catch Ezra and crew they never let up even when they lose the fight. Relentless and intimidating are words I would like to use. I cannot wait for this show to bloom and really grow into itself and show us its true potential. As Jedi Master Yoda once said, “Do or do not. There is no try”. Dave Filoni and crew do and exceed at it greatly. We are only so fortunate to be left with these amazing storytellers after Lucas stepped out of the picture that keep it true and straight as an arrow. Star Wars Rebels premiers October 3rd on Disney Channel at 9pm ET. Early viewing on WatchDisneyXD app starting today for subscribers.